Art lessons can be expensive in the world of painting. Not only does it take a lot of time to prepare your studio to paint, it also requires you to purchase a lot of material. For example you will need a brush of course but not just one brush, you will need different styles and sizes. You will also need the canvas to paint on with an easel to support the canvas at a position that is comfortable for your posture. A cup of water is also important to keep your brushes wet during the painting process. Don’t forget the paints. If you want to keep the cost down you can just purchase primary colors and mix them for the desired secondary color spectrum. Last but not least is paper to keep your area clean, along with an apron so you do not ruin all of your cloths. When it is all said and done you are looking at hundreds of dollars or more, depending on the quality of material. If cost is an issue for you, or you just do not want to deal with getting the studio space and all of the supplies then you need to try Painting with a Twist in Slidell. They are not just studio space, they are the entire painting experience in a fun social environment. They create a wonderful creative experience for all skill levels, for a low price. It is $35 to take a class which comes with an instructor and all of the supplies you will ever need to paint your masterpiece. You really can not beat it! You will be amazed by how good the instructors are with helping those who have very little experience. At the end of the event everyone has a great piece of art to go home with and put on their walls. 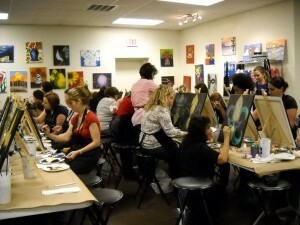 To book your class just visit their calendar at Painting with a Twist in Slidell. Once on their calendar search for a painting on a day that works best for you. You can then add it to your cart and checkout. During the checkout process you will need to fill outn a reservation form and make a payment to secure your spot. That is it! Easy, Peasy, Japanesey! Happy painting! This entry was posted on Wednesday, February 24th, 2010 at 2:39 pm	and is filed under Studios. You can follow any responses to this entry through the RSS 2.0 feed. You can leave a response, or trackback from your own site.